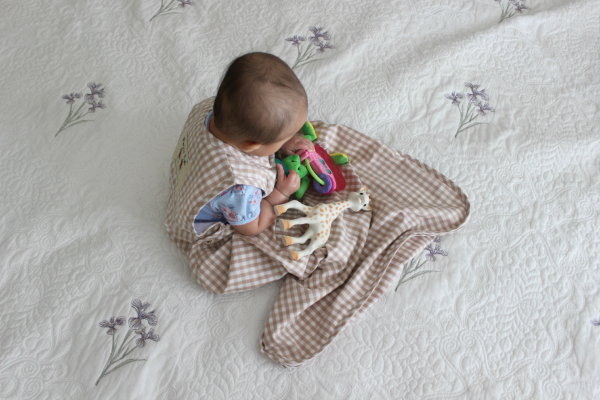 ** The nice people at Merino Kids sent us a sleep sack to use in exchange for a product review. The opinions are my own. I was not compensated for this post. When Presley was two, three and four months old, I naively started to believe that we knew her sleep routine and that we had a great sleeper on our hands... and then she kindly jolted me back to reality. Usually, she would be up once or twice during the night, but I had her back to sleep within 15 to 20 minutes. Sometimes, she slept for 7-hour stretches. Those nights, I celebrated quietly to myself while biting my bottom lip and pumping my fist in the air. (Not really... or did I?) It was fun while it lasted, but I eventually learned that I was not destined to be one of those cool moms who would get to plaster her child's bedhead all over Instagram with proclamations of parenting a child who sleeps from 7:00 PM to 7:00 AM followed by ten "praise hands" emojis. It just wasn't meant to be. Figuring out baby sleeping patterns and routines can be tricky. There is a lot of information on the internet which is helpful and overwhelming at the same time. Friends and family share their experience, but it doesn't always work, because all babies are different. We have tried slumber music which grabs her attention initially but doesn't lull her to sleep. S knows her nap schedule really well since he is with her all day. I've tried to establish a bedtime routine so that she knows what to expect and understands that it is time to sleep. Now that she is teething, she may or may not be cranky in the evening, so we roll with whatever mood she is in that night. 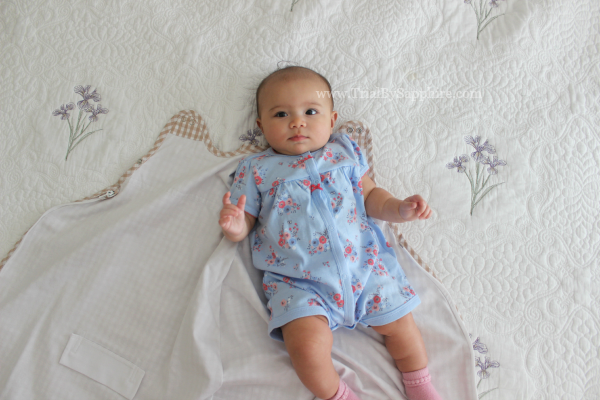 We focus on keeping her comfortable which means holding her just the way she likes, nursing her, and dressing her so that she is cozy but won't overheat. Keeping her from getting too warm is something that we've been conscious of since she was born. Being a February baby, she was born when it was still very cold outside. It snowed and rained a lot the week she was born, so naturally, I was really focused on keeping her warm. Well, it turns out that when it comes to body temperature, she takes after her daddy, not her perpetually cold mommy! This summer has been hotter than usual in Memphis, so we limit the amount of clothing she wears. While I have friends in cooler climates dressing their babies is cute ensembles, I'm like, "Yeah, a diaper and short-sleeved cotton onesie will be just fine... or maybe just a diaper?" Ha! We sleep with a fan on at night, because we like the feeling of air circulating in the room. Since Presley can't sleep with a blanket yet, it's the one time of day that she actually wears clothes (long-sleeved shirt, socks, and leg warmers or pants). She has a habit of using her shirt as a teething toy, so her belly ends up exposed. I looked at sleep sacks online for a very long time, but to be honest, I didn't want to fork over the cash for a good quality one. What if she didn't like it? What if it made her too warm? Merino Kids, a company which I had already heard and read so much about, sent Presley a sleep sack, and hello! I get the whole organic cotton sleep sack thing now. It's true that you get what you pay for. It's a wearable blanket that she can wear for at least another year. She doesn't get tangled up in it, she doesn't overheat, and it is soft yet durable. We haven't had to do middle-of-the-night diaper changes for a few months now, but if we still did, it would be a breeze since the sleep sack unzips from the bottom. It's easy to get her in and out. And! And! It is designed so that it can be used while a baby is secured in a car seat. Why didn't I think of that? So smart. Keeping her comfortable means better sleep for her which means better sleep for Mommy and Daddy. Yes, please! What a great product. A sleep sack with no sleeves, and made with cotton material! I love the neutral gingham pattern, too. Sweet P should be a baby model! Are there any talent agents in Memphis?